Most of us live in a house that has been constructed for some time. Design, physical and chemical barriers are already settled. However termite threats are out there and we surely don’t need to encourage them! The serious termites start their nest in even small bits of wood in the soil and take a couple of years to build their numbers into a threat to our houses, sheds, fences, loading ramps, etc. The nest will move deeper into the soil over time but will seldom move laterally. If you are keeping bits of timber in case they might come in handy one day, stack it on blocks or racks well above the ground so you can look underneath for the tell-tale tunnels. 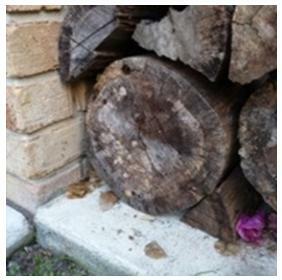 If you choose masonry or concrete blocks to stack your timber, place them on their sides so termites don’t travel unseen up the hollow cores. If you are storing cellulose material (tax papers, books, photos, cupboards, etc) in a shed or basement with a concrete floor, do not place the boxes across any expansion joints or cracks in the slab. 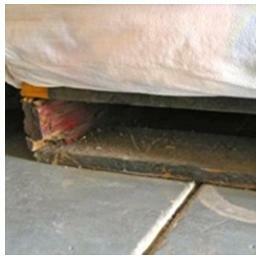 A crack 3mm or wider will allow termites access and you won’t know about it until too late. Look carefully and you will see a weephole between the bricks above the dampcourse. If you can’t check every weephole at a glance as you walk past, you are flirting with financial drainage! We surround our homes with plants and use mulch to retain water and reduce weed growth. Nothing wrong with that. However, the top level of the soil/mulch must be at least 100mm (4”) or more below the dampcourse and weepholes. The Australian Standard says more but we want our gardens to look ‘right’ and we often ignore the advice. Soil level really should below the top of the slab, but it rarely is. 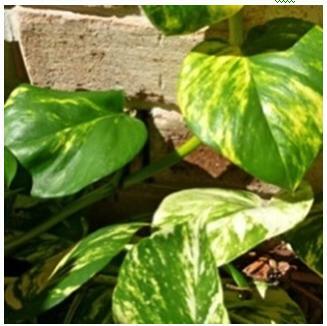 Plants must not block your view of those weepholes; creepers and dense plants such as mondo grass can easily hide a termite tunnel. If termites are about, you will occasionally find them foraging through mulch. If they stayed in the mulch, OK, but being inherently sneaky, don’t count on it. That’s why you use a monitoring system. At least have some trapping monitors in the garden so you get to know about termites before they find a way inside. It’s much easier to feed and eliminate a colony attacking a monitor. If you live in a house that has suspended floors, at least you can get under (hopefully) and check for termite tunnels up the foundations. Don’t store cellulose material under there. Steps, retaining walls, garden seats, decking and anything else made of wood is an enticement; these items need to be regularly checked. Preserved timber has been readily available for years and most tradies would use it. The previous owner may not have been so diligent and once it is painted, it is hard to tell if pre-treated timber has been used. There is another trap for you — pre-treated timber comes in various grades; H2 and H3 are only decay/mould resistant. H4 and H5 are also termite resistant and H6 is all of the above and is used in constantly wet/marine situations. Putting firewood on concrete means the termites won’t find it—wrong. And this pile is covering up a couple of weepholes as well. You could put some monitors nearby and kill off colonies so instead of feeding firewood to termites, you get to burn it. Old railway sleepers are often used as steps, edging, retaining walls, the gardener’s seat for a contemplating moment, etc. Don’t discard them unless you really want to go modern instead of rustic. Put monitors in or on the fill above the retaining walls and nearby. Killing termite colonies will mean there are fewer termites to eat your sleepers and they will last for decades longer. Spend your money on something else — or save it. Both these pergola posts are on galvanised stirrups. During your inspection you could see if a termite tunnel went up the stirrup on the left. The lawn surface has been built up to the post on the right and termites could go up the middle of the post and then across to the house. Additions such as pergolas, BBQs, cubby houses and dog kennels can act as a bridge across from soil to building. 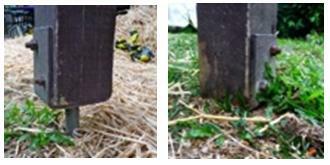 Ensure there are no termite tracks up the galvanised stirrups or across to the building. 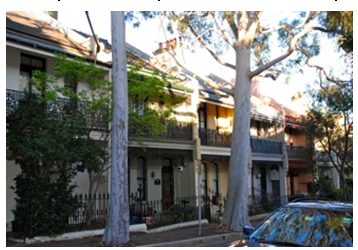 Eucalypts and fruit or other trees that develop a hollow “pipe” up the centre as they age should not be near buildings. If they are, check them regularly. If there are dead trees or stumps, with or without the usual camouflaging vine, you probably should make the effort to be rid of them. Nearby monitors are a must if moisture is a potential problem. Termites would much rather forage through moist soil than hard, dry, compacted soil. That’s why monitors in the garden are so effective. Monitors don’t entice termites closer to your home. They find monitors because scouts were already in the vicinity. However if there is a drainage problem causing a wetter than usual patch beside or under the house, you need to install some drains to carry moisture away past the building. The southern sides of buildings do not get as much sunlight and soil stays moist for longer after rain. Monitors again. Air conditioning condensation pipes are supposed to be plumbed into drains these days, but if your home was built a few years ago, the pipe may just run onto the footpath or into the garden or lawn. Termites don’t ask for much out of life. Just moisture and something based on cellulose to eat. They bring their own protective ‘mud’ and their ingenuity to find a way to food. Your job is to deny them wood. Or at least to make them show themselves by making them cross open impervious areas so their tunnels will be visible. And, use monitors to trap/trick them into telling you when they’ve arrived — but you need to inspect them regularly.